On July 27, 2018, legendary actor and stand-up comedian died of pneumonia at the age of 100. 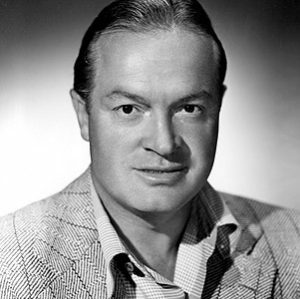 On July 27, 2003, actor and stand-up comedian Bob Hope passed away at the age of 100. Hope is best known by many for his lighthearted stand-up comedy routine, thanks to his hosting of the Academy Awards (19 times! – more than any other host) and other shows, but also his frequent tours for the United Service Organization (USO), entertaining active duty troops. However, people tend to forget his extensive acting career, which began in 1934 and included more than 50 starring roles, along with other roles played as a supporting actor. Though he never won a competitive Academy Award for his acting talents, Hope was given 5 honorary Academy Awards during his career.